This really doesn't need to be its own separate post, but it was my favorite thing in Athens, so I felt it deserved its own space! As we had some extra time and the admission was only €3, we decided to go in. We did not get the free audio guide that was available (so all info I list is from the very very trusty wikipedia - hah!) - we had a bad bad experience with audio guides at Stonehenge last summer, but that's a whole other story. Visitors to the stadium are free to roam wherever they please, and we took full advantage of that! We headed right on up the stairs. It isn't so obvious from the picture, but the bottom few steps were actually really deep. Once we got to the top, we all kinda went in a few different directions to snap some pictures and take a look around. 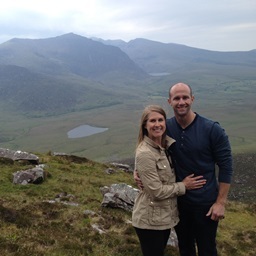 This is about the time when I got that "wow" moment that occurs each time we travel. From the top, we had a great view back toward the Acropolis that we visited the day before. The Panathenaic Stadium was originally built in 566 B.C. Who knew there were games that far back in time?!? 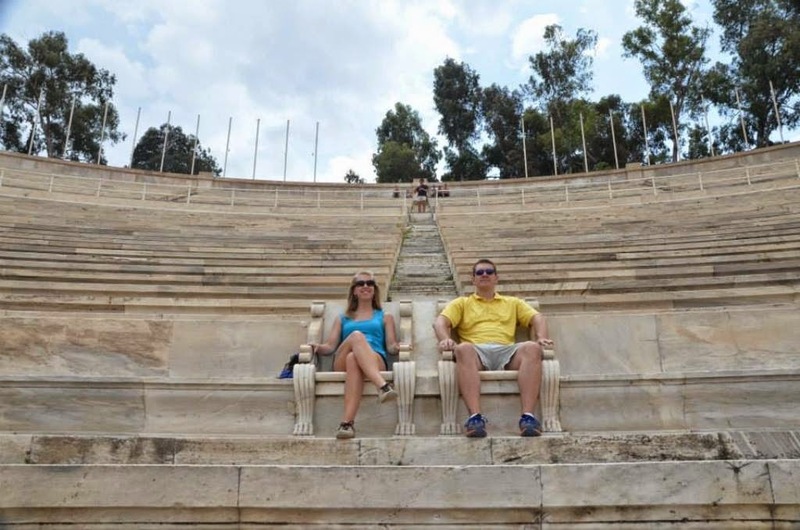 Over the years, the stadium went through a few refurbishments, including being rebuilt in marble. The games event was originally called the Panathenaic Games until 1870 when they started being called the Olympic Games. In 1896, the first Summer Olympics were held in the stadium which then started what we know the Olympics to be today... sorta. The track on the stadium is very skinny and different that the tracks we are used to. I can't imagine sprinting around the curve of that skinny track - it seems practically impossible! We moved our way around the top of the seating area until we got to middle section. The stadium is not fully enclosed - it seems most stadiums we see today are steering away from this style. Behind where Luke and I are standing, but toward the bottom of the seats, are the seats where the Emperor sat. We couldn't NOT sit in them and pretend we reigned all! Of course, Luke felt the need to get a little too comfortable. Next we went down to the stadium floor. 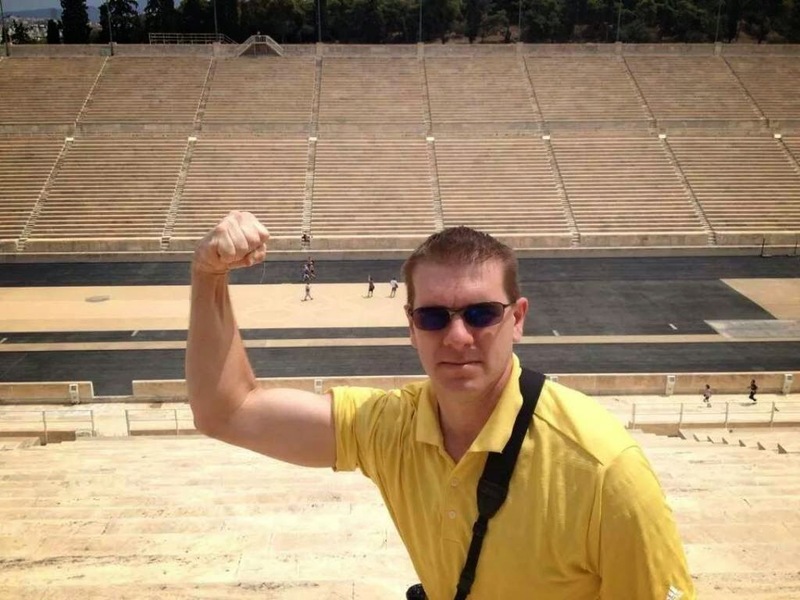 It was pretty neat to be standing on the grounds where the first Olympians stood! 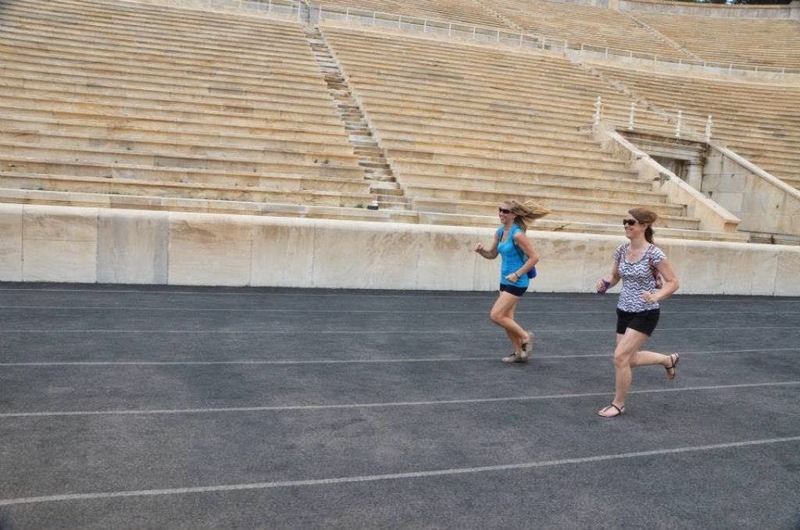 What's a visit to the Panathenaic Stadium without a few challenges? First I challenged Becca to a race on the track. 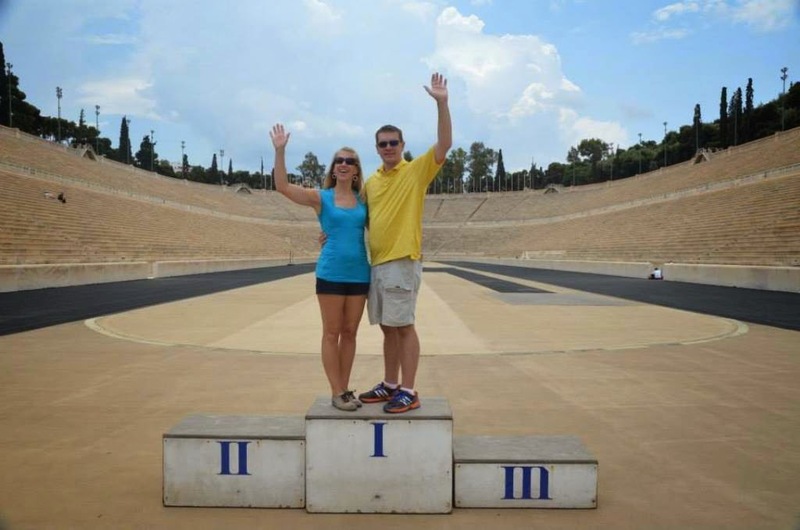 But our sandals weren't the best sprinting shoes and we didn't want to pull a muscle, so then I decided we should compete in the best Olympic sport EVAR - gymnastics! Clearly, Becca beat me on this one! But we both got a round of applause from some viewers in the stands :-) In the end, all four of us were winners although Luke said he was the only first place winner because there can't be a four-way tie... but I think we can all agree on who the loser was hehe. Fun fun times!! We spent more time here than we expected, but it was fun, and I very glad that we chose to go into the stadium. Go Team Greeciversary! The stadium currently holds 45,000 spectators. In 2044, when the Summer Olympics were held in Athens, the Panathenaic Stadium was used for archery and the finish for the marathon.